I'm so very happy you're here today because A Blog Named Hero is turning TWO today and to celebrate, we're having a Blog Hop with some of our bestest friends and supporters!!!! Since this is such a long hop, I wont go into details on how I created this card, but if you have questions, please let me know! Now the next stop in the hop is my sweet, amazingly talented friend; Jennifer McGuire. Be sure to leave comments on each of the blogs and we'll draw two lucky winners thanks to Hero Arts and Simon Says Stamp, who are offering mystery prize packages! Ok. See you again soon! So fun! Wonderful acetate card, Linda! Very fun! Love making acetate cards! I have never made an acetate card, but I sure love the way they look. This one is great. fun card! enjoy the gold dots! Very cool card!! Thanks for the chance to win! How fun is that! Love the floral design on acetate and that fun tag with die cut sentiment!! Wow! I like a lot! The acetate was a great idea for this card!! Cute card. Someday I'm going to be brave enough to try an acetate card. Acetate on a card? Who knew! Lovely. What a fun B'day card!! Love the colors you chose and the white on acetate stamping! I just adore acetate cards and yours is simply amazing. Love that you used acetate! I love, love, love those Happy Birthday dies! Your bright and cheerful card just makes me happy! Love the acetate, the white ink floats so magically. What a wonderful birthday card! Love your acetate card! Congratulations on two years of stamping fun! Other than shaker cards, I've never made an acetate card. Thanks for sharing! I always forget about using acetate cardstock... will have to try it! Tks for sharing... congrats to 2nd year! 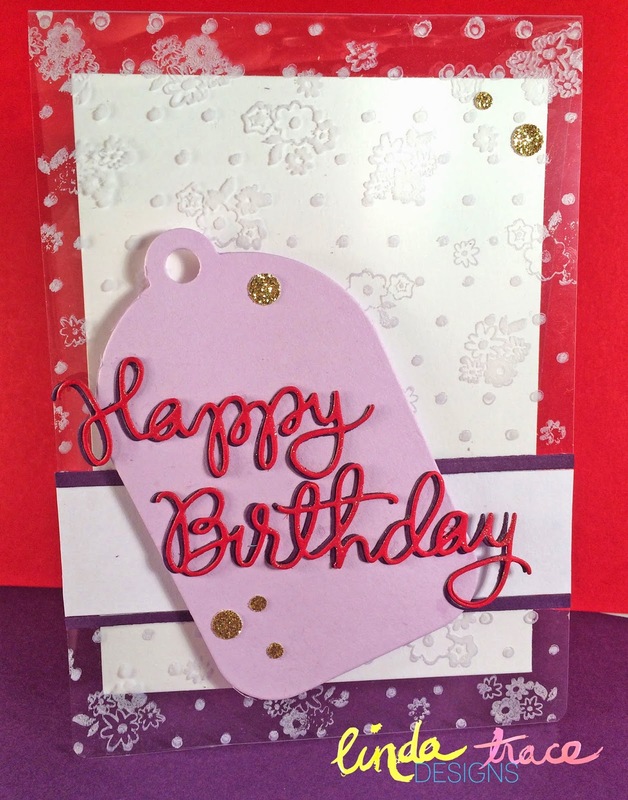 Beautiful card, so much going on with it, and I loved the Happy Birthday die cut. Love the acetate background. Lovely card! Very nice acetate card...love the tag and hb die. I love the acetate in your card--the whole thing turned out beautiful! Thanks for sharing! Love the inspiration! Great use of the acetate!! I've not tried acetate yet…intriguing! I love that you chose acetate for your card, Linda...it's so pretty! Like the bright cheerful colors & acetate clear look. This is wonderful! Love the acetate! Beautiful card I love cards made out of acetate as well great job! Thank you for the inspiration. Script die cuts are some of my favorites and I like to see how people use them. I'm new to card making and haven't added acrylics yet. Wonderful card. Love all the color. TFS! Love the acetate and tags on cards are my fave! I just love your card made with acetate. I love you're design. I have always liked the look of acetate cards and have never tried it! Love the acetate effect too! Really beautiful card! I haven't made an acetate card in years! I like the design on yours. the tag is great w the acetate card. Pretty colors and I like the tag. what a fun blog hop. this is my first time. Love the unconventional colour combo. Love your card! All the beautiful colors and the white on the acetate are just great. Fabulous design, love the added acetate!!! and here is to many more! I love your card. Doing a clear card is some thing I need to work on. Acetate card is such a great idea. I'll definitely have to try one. Love the acetate! Such a fun card. I've never made an acetate card. So much texture - great card! The card is beautiful, the acetate card is a fantastic idea. Thanks for the inspiration. I love the way acetate looks - great card! I tried heat embossing with acetate once, didnt work. Must be time to try, after looking at your beautiful card. Wow this card is beautiful love the acetate. Thanks for sharing and congrats on the second anniversary. love the card - I really should get around to trying a card with acetate again. Thanks fo rthe inspiration. Lovely card. Thanks for the chance to win. Luscious card, I will have to give acetate a try! Hero Arts do crazy things, I should be buying more of there stuff!! love the idea of having a transparent card! I must try it! Your card is so darling I love the dimensional look of it and how clever and creative you were. Thanks for the head up about acetate as I've just begun using acetate in my scrapbooking but never thought of using it this way so thanks sweetie for sharing all of your awesome tips and techniques YOU ROCK!! Love your card! Looks like a lot of work went in to it!!! So cool and different! Thanks for sharing. Love your card - the acetate is great! What a special card! Love it! Happy Birthday to ABNH. Love all these sites and the wonderful ideas. Here's hoping I can win some stuff to try out new things. I also love that I can get to see new designers that I would have otherwise not seen if I had not followed this thread. Cheers. I agree - clear cards add such a FUN element! Love the shadow effect on your greeting too! Great card! This is something I have never tried. You have inspired me! Thanks. Gotta try this super card technique! Acetate is tricky. You did a nice job. Love the happy birthday cut! Very cute card using acetate!! TFS! Cool look with the floral and modern look mixed together. I think the acetate make it work. Love the little flowers in background - the acetate is a nice touch! What a great card using acetate! Love the different layers you were able to achieve. Love this card!!! I'm full of ideas!! Great card! Love the use of acetate. The acetate gives it such a cool look! I've always wanted to try an acetate card; now maybe I should! So bright & cheery, it just LOOKS like a party!! Really like your idea using the acetate. Can't wait to try! Really pretty card and love the acetate card idea!! Nice project and full of colors! I love the acetate layer, adds so much! I love your card!! Can't wait to see the rest of the Hop!! Super fun card! Love the acetate notecards! Thanks for sharing! Cool card, love the look of acetate cards. Seriously loving acetate right now. Love that you made an acetate card! How fun! I still haven't tried an acetate card and I keep meaning to. thanks for the inspiration. Your card is very lovely, liking the acetate! Awesome card! Love how you stamped on the acetate! Great job. Thanks for sharing. Super card - love the multi-layered look. I really want to try creating an acetate card. My mind is just spinning. Thanks for the tutorial. Great use of acetate. Thank you. Fabulous card! Love the acetate and the colors! Love the clear card! I need to go and make one! Cool acetate card! Lovin' it! I need to try the acetate card. It would be a unique card for someone special. Love the tag. I like the design on the acetate portion. I've never tried doing an acetate card...but would love to! Your card is great! Beautiful card! I am not brave enough to try an acetate card. great card! I love all the bright cheery colors! What a different card! I love the acetate! I love how you used the acetate. Very nice. Love acetate cards and this is is great! great acetate card! love the big sentiment! Love your card and the use of the acetate. Thanks for sharing. Love the stamping on the acetate. The delicate flowers reminded me of snowflakes! 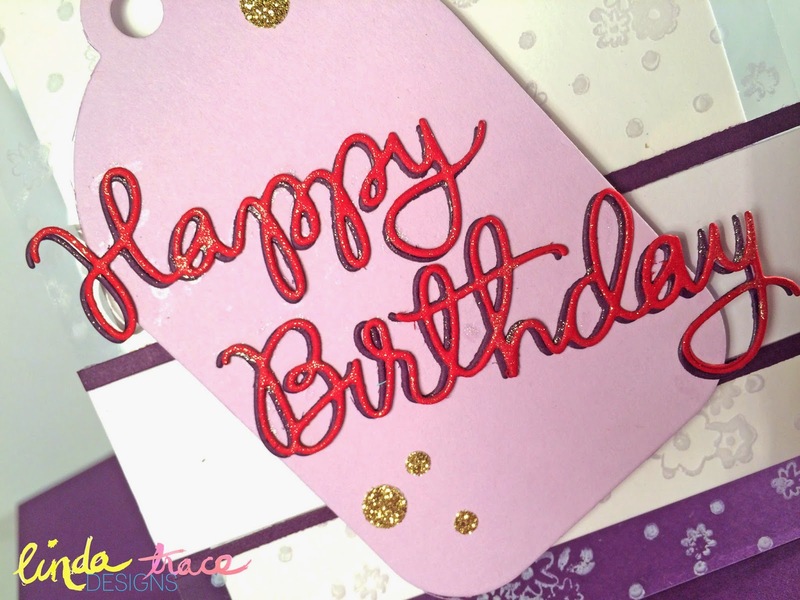 Such sweet colors for a fun and bright birthday card! Love the acetate card. I've done these before and I really enjoy looking through to the sentiment! love the look of the lettering on the acetate. Thanks so much for sharing. Great card. Love the acetate. Beautiful card, TFS! Love Acetate! What a cute card Linda! Happy Bday ABNH! Great card, I really like the acetate idea! Love the use of acetate...fun card! An acetate card...SWEET! I love that! Thanks for sharing! your card is really amazing! Love it! I just recently did an acetate front on a card! Lovely card, I like the stacked die cut sentiment. I love that Happy Birthday script! 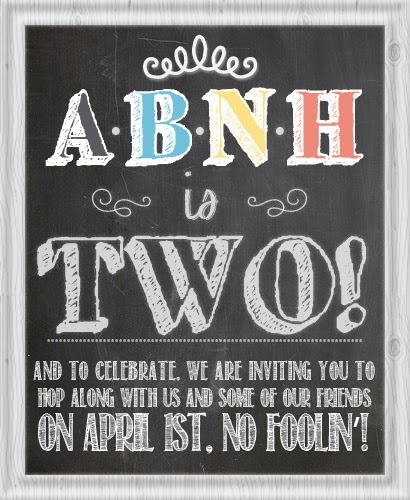 Wow....very pretty birthday card for ABNH's 2nd BDay. It's so nice to see everyone's card. So many talented people. I'm learning so much and the card-making community is GREAT! Thank you. oooh, going to purchase some acetate right now - love this look! the Peek a boo is always so fun!!!! Thanks for sharing your card. Love your see through card! wow... thanks for the chance! I have some of these acetate cards but haven't use them yet. Maybe I will now! Wonderful card...love the stamped acetate! I hate to plan also lol. I love your acetate card.